BBC will not broadcast Short Programs! .... I hope that other Television will not follow BBC in that stupidity! The National Ice Skating Association (NISA) are pleased to announce the BBC broadcast schedule for the ISU European Figure Skating Championships 2012 which includes live Red Button coverage and a BBC2 highlights programme. The event takes place in Sheffield from the 23-29 January 2012 when 200 elite international skaters from 39 countries will descend on the city. Skaters will compete in Ladies, Men, Pairs and Dance disciplines and the BBC will be there to capture all the competitive action. On Sunday 29 January 2012 from 13:00-14:30 on terrestrial channel BBC2, there will be a one and a half hour highlights programme featuring all the top action from throughout the Championships. The BBC have also scheduled over 14 hours of live Red Button coverage for the rest of the week’s action. Live on Thursday 26 January 2012, from 18:30-21:30 on the Red Button will be the Pairs Free Skating, with Friday’s Ice Dance competition shown on the Red Button from 18:00-21:20. Saturday’s men’s and ladies free skating competitions will enjoy a combined eight hours of Red Button live coverage with the men taking to the ice from 11:55-16:00 and the ladies competition being broadcast between 17:30-21:25. Please note that all broadcast details are subject to change. Girls, look what time has cekoni sent the message. Cekoni, when do you sleep? Men - PRACTICE, DRAW, COMPETITION SCHEDULE etc... aka - "Plushy's Schedule"
As England gears up to be the focus of worldwide sporting attention in 2012 for the London Olympic Games, another major event is set to catapult the country into the global limelight. The ISU European Figure Skating Championships are being held in England for the first time in over 20 years after Sheffield was successful in its bid to stage the prestigious event. It is the third largest competition involving figure skaters, behind the World Championships and the Winter Olympics. Nearly 200 skaters from 40 countries, including many Olympians, will take part in the prestigious championship in Sheffield from January 23-29. In the line-up of world-class skaters will be 2006 Olympic champion and three-time World champion, Evgeni Plushenko. The International Skating Union (ISU) granted Plushenko an exemption to compete in the European Championships 2012 last week following a request from Russia. Skaters are normally required to have attained a minimum score in an ISU competition this season or last season, however Plushenko has not competed since Vancouver making him ineligible. The ISU have lifted this regulation to allow Plushenko to compete making this year’s Europeans an even more thrilling competition for spectators given his list of achievements. He is the 2006 Winter Olympics Gold medallist, 2002 Winter Olympics Silver medallist, and 2010 Winter Olympics Silver medallist, making him the only male figure skater in the modern history of the sport to have won three Olympic medals in singles. 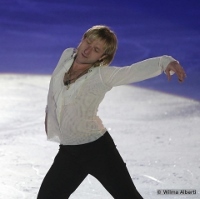 Plushenko was also crowned World Champion in 2001, 2003 and 2004 as well as winning the Europeans title six times. Заслуженный тренер России Алексей Мишин признал, что для Евгения Плющенко чемпионат Европы станет лишь этапом подготовки к Олимпиаде в Сочи. – Чемпионат Европы мы с Евгением рассматриваем как этап подготовки к другим турнирам, главным из которых, не секрет, станут Олимпийские игры в Сочи. Женя опытный спортсмен, он прекрасно понимает, какое значение сейчас имеет для него каждый старт, и не строит по этому поводу никаких иллюзий. К сожалению, у Жени есть определенные проблемы со здоровьем – только без подробностей об этом. Сильно ли они мешают ему в тренировочном процессе? Вряд ли они могут помогать, правда? Мешают, конечно, но мы продолжаем работать. – С какой программой Евгений будет выступать в Шеффилде? – Поедем в Англию с той же программой, с которой выиграли чемпионат России. Какие-то изменения могут быть внесены в зависимости от того, какое количество сложных прыжков будет делать Женя. Предварительно четверной прыжок входит в наши планы. - only Eurosport France will broadcast complete competition LIVE (SP & FS) .... also and Japanese JSports 4! - other Eurosport local channels will broadcast just Free Programs (delayed, shorter version) ... EXCEPT Men FP - this will be LIVE! * ROTVR Romania http://www.tvr.ro/live_tvri.php ????? I need help from you friends! - you need to find Live Stream links for "Eurosport France" and "France 2"
Deux mois avant le grand rendez-vous mondial du patinage artistique à Nice, dont France Télévisions sera le radiodiffuseur hôte, France 2 et France 3 proposent de suivre les meilleurs patineurs européens et en particulier les français à l'occasion des Championnats d’Europe à Sheffield (Angleterre) fin janvier. Le programme libre hommes où nos patineurs, Florent Amodio et Brian Joubert, défieront le redoutable Evgeni Plushenko, multi-médaillé olympique. Le gala de clôture en présence des meilleurs patineurs de la compétition et des médaillés européens. Tout au long de ces Championnats, les commentaires seront assurés par le trio de France Télévisions : Nelson Monfort, Philippe Candeloro et Annick Dumont. Мы с мужем тоже едем на ЧЕ, то что Евгений там будет выступать стало хорошим подарком к Рождеству! так как билеты брали еще в мае. Если кто едет и хочет встретится пишите в личку. Всё будет как должно быть..